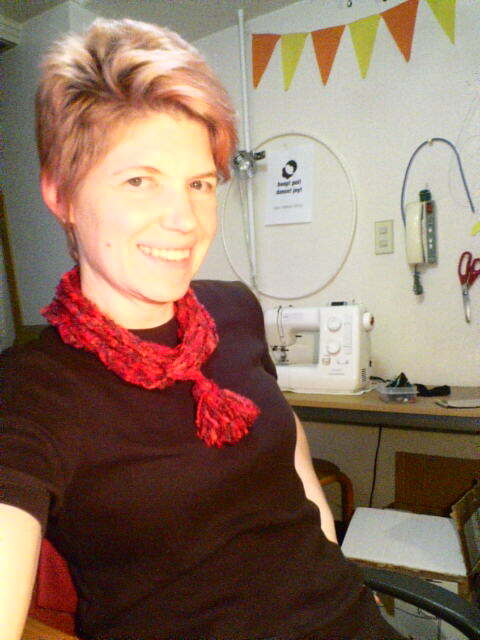 A couple of weeks ago, I bought some fluffy reddish yarn and decided to crochet myself a scarf that I could wear as an accessory in my chilly apartment. I wanted something long and soft and beautiful to wrap around my neck. I was a great idea, except I don't crochet well at all. So after I unraveled the wonky rectangle that I'd formed, I reverted to the one stitch I can do consistently - chain stitch. The result was exactly perfect. I made a very long chain, wrapped it into a loop and attached a tassel. The scarf can be worn long (nice with a dress or tunic) or looped into shorter lengths in a number of ways. There are far more than nine ways to wear this. Make a tassel. I did mine by wrapping the yarn around my Moleskine notebook about 30 times, then slipped it off, folded it in half, tied it in the middle and again around the bundle to make a ball. Trim the ends and fluff as desired. Once you have your tassel, set it aside. Crochet a very long string. 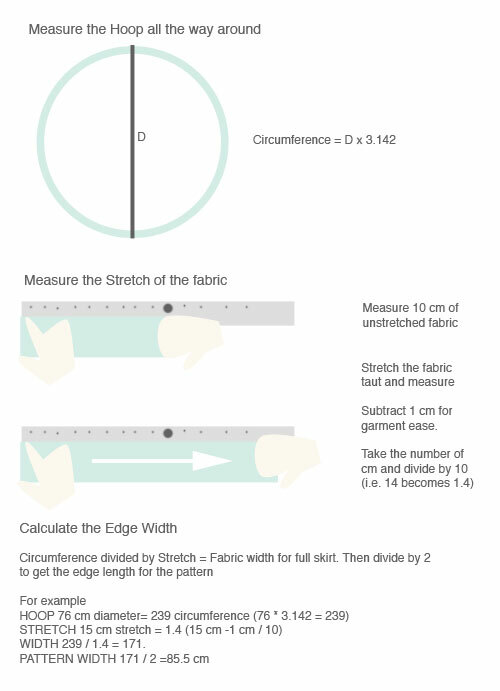 It should be nine to ten meters long depending on how long you want your scarf to be. (I looped mine around my neck and down as far as my belly button.) Depending on the size of your skein and how much yarn you used for your tassel, you'll get close to finishing it all. Loop the chain to make a circle with five strands on each side. I hung it over a hook as I looped to help me keep it even. At this point you can unravel or continue chaining to get the length just right. Connect the ends of the chain by crocheting them together or tying them. Attach the tassel. I used the tail ends of the chain to thread my needle, and sewed through the tassel, then tied the tails and threaded them vertically down through the tassel, trimming the ends to length. 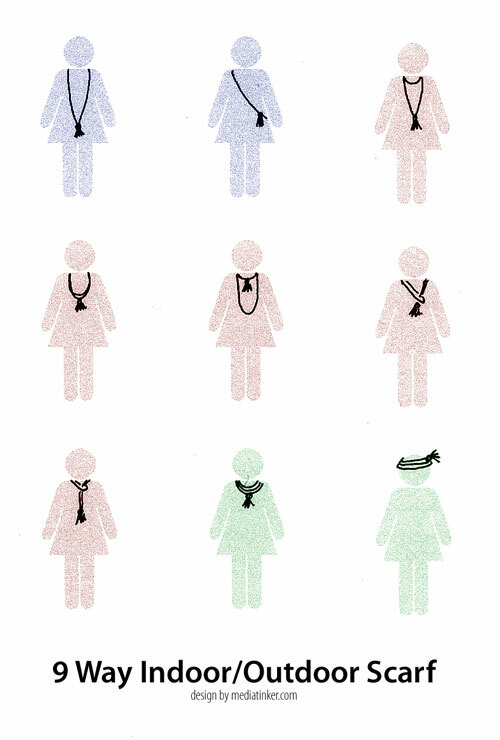 To gift one of these scarfs (it's a quick and easy stocking stuffer), you can print a 4-up A4 sized version of the graphic (Download PDF) that shows ways to wear it. Quarter the page, roll and tape the sheet, and slide the folded scarf inside with the tassel hanging out. 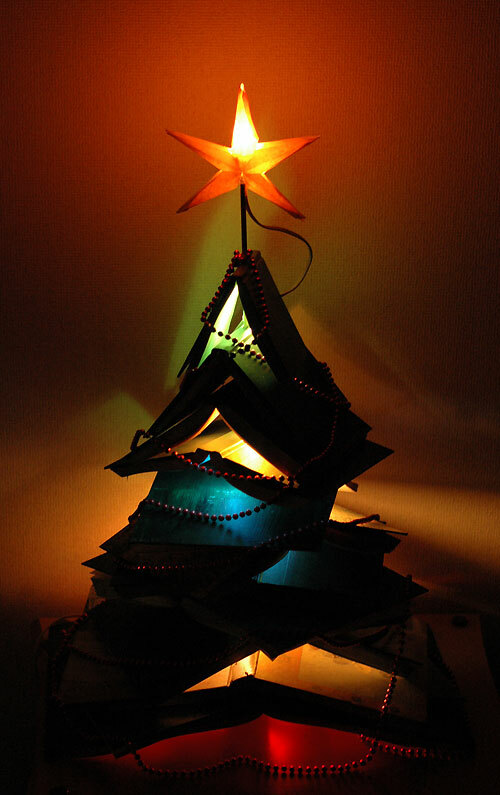 For the past nine years I've crafted a Christmas tree out of found objects, bits and pieces, useless odds and ends and occasionally a purchased item or two. This year, we had a box of books that we'd been trying to give away since the summer. 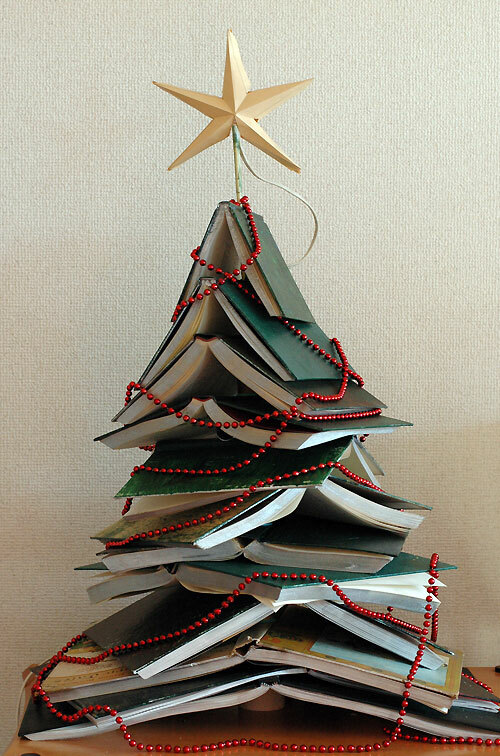 A dozen hardcover castoffs became the foundation of the Christmas tree. I am especially pleased with the way this tree turned out. But it was a 4-step process that took most of an afternoon, so I couldn't do the complete construction on Christmas Day in my usual tradition. Here's how it worked, in case you want to try one yourself. Step 1: Drill This caused a bit of controversy in the household. Tod didn't want to hurt the books. I wanted to spike them so they wouldn't collapse. He went to work without a better suggestion and so I drilled the books by opening each book to its center spread, laying it page-side down and using a hand drill through the middle of the spine. Step 2: Paint I silvered the edges of the pages with spray paint to make them consistent. The titles ranged from Great Grillin' to a 1963 children's edition of the Canterbury Tales and the covers were a range of tacky and plain so I decided to paint them with a mix of green acrylic paints. Because I like the artwork on the Canterbury Tales, I left that one unpainted and dry brushed any of the beige books to coordinate, while giving good coverage to the blue, black and red tomes. Step 3: Assemble This was a little bit harder than I expected. It took several attempts to get the spacing and shape right so I was sliding books on and off my dowel rod multiple times. The dowel I used was thin and flexible, so the tree leans a bit. 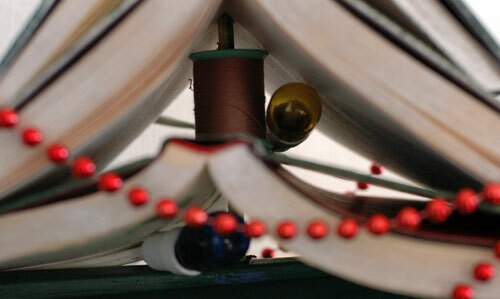 I slipped a small spool of brown thread on the dowel after each group of three books. This enforced a few inverted Vs big enough for the lights. Just like a real tree, I need to rearrange the lights - there are some dark patches! Step 4: Light I topped the dowel with a cut-and-glued star made from a manila envelope, and tucked a string of colored bulbs in the spaces between books. This makes the tree glow gently in the dark. Reduction printing is a way to make multiple color prints in limited edition series. 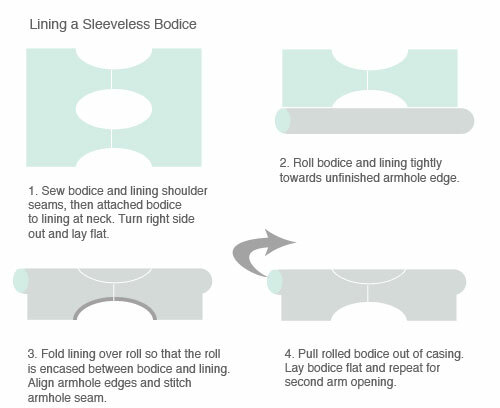 Unlike traditional block printing where each printed color is a separate piece of carved medium, in reduction printing you use only one block. As you work, you build up the colors of your final picture after carving away more and more of the print block. Because you are destroying the previous layer as you create the next one, the final prints can never be reproduced. In this tutorial, you’ll work with a rubber eraser as your print block. There are instructions to make two different four-color designs in limited editions. 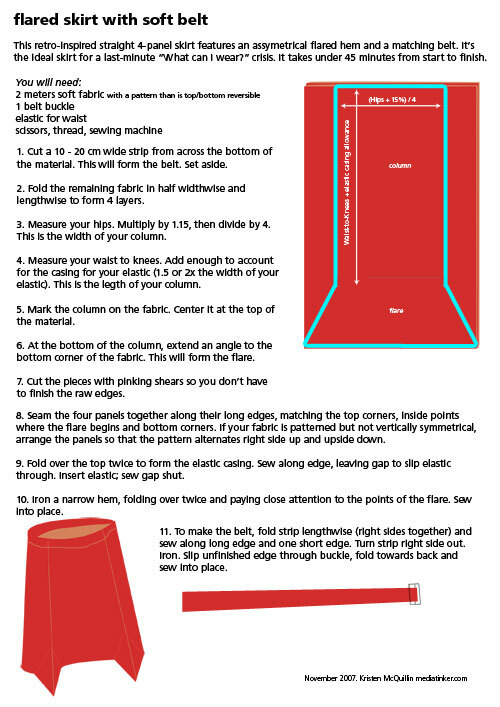 You can download a PDF booklet of the instructions and add the necessary materials to create a mini craft kit to give as a gift. Or follow along here for your own fun crafternoon. This is a simple four-color reduction print, where each new color adds detail to the layer below it. 1. Four an edition of ten prints, count out 14 printing sheets. I always print a few spares to compensate for the inevitable mistakes. Remember that you can never make more because you must cut down the block to finish the print. Using your craft knife, cut away the area for the clouds as shown in the House: Sky Blue image. Print the sky blue ink once on each printing sheet. Allow to dry. 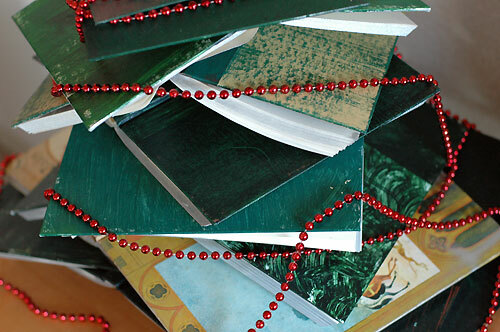 Next, using House: Green as a guide, cut away everything that won’t be printed in green. This preserves the blue sky and creates a base for the house and tree. Paying close attention to aligning the colors (see note on registration below), print over your sky blue layer with the green ink. Print all the sheets and allow to dry. 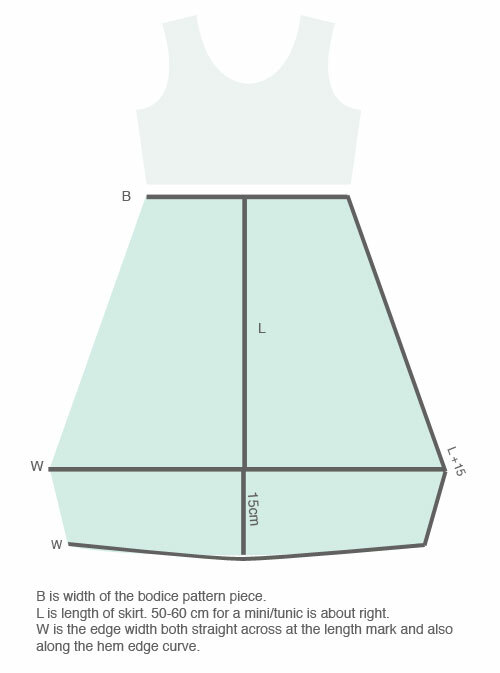 Now, using House: Blue as a guide, cut away the areas that will remain green, keeping what will be printed in blue. Print dark blue over the other colors, paying close attention to color registration. Allow the sheets to dry. Finally, with House: Black as a guide, cut away the areas that will remain blue, leaving only the house details and tree trunk. Print black over the other colors. Allow prints to dry. In this reduction print, details are added in multiple colors as the general shape is revealed. Count out printing sheets for your edition. Remember that you need to make a few extras to cover any mistakes. Cut away the white area as shown in the Flower: Sky Blue image, below. Print the sky blue ink as many times as you want prints. Allow to dry. Using Flower: Green as a guide, cut away the center area of the flower, keeping the petal details and center of the flower. Carefully registering the block, print over the sky blue layer with the green ink. Print all the sheets and allow to dry. 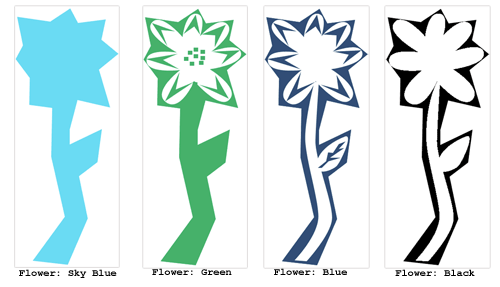 Using Flower: Blue as a guide, cut away the stem, leaf, and center areas that will remain green. Print dark blue over the other colors, paying close attention to color registration. Allow the sheets to dry. With Flower: Black as a guide, cut away the leaf and flower details that will remain blue. Print the final black over the other colors. Allow prints to dry. Aligning the color layers is critical to having a neat finished print. 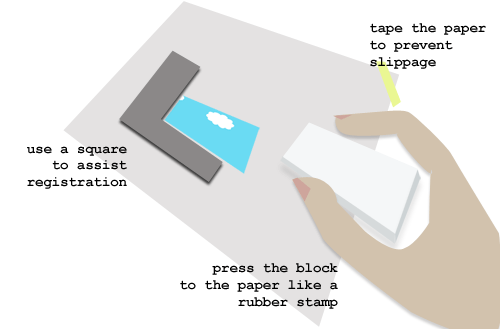 With small print blocks like rubber erasers, use the block as a rubber stamp. Tape each printing sheet paper to table to prevent it from slipping and align the corners of the print block to the previous color layers using a square. 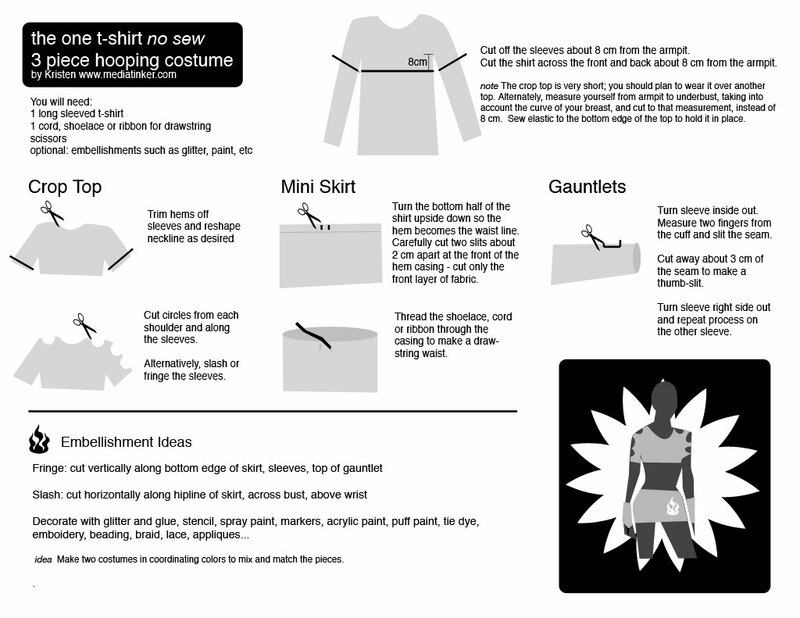 As presented at Spin Matsuri, a quick, inexpensive way to create a costume base that is suitable for hoop dance. Also makes a good superhero costume if you add a cape. 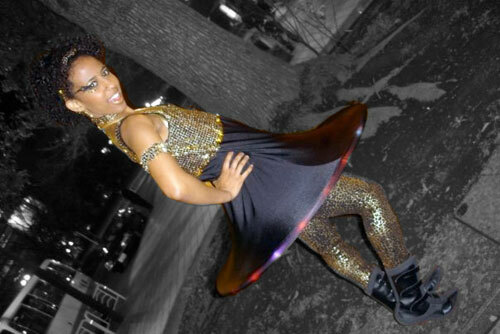 Add your own style with fringing, slashes, bling or paint. Hooper trading cards! Thanks to a funny comment by my husband, hooper trading cards are unleashed on the Internet. Collect them all! 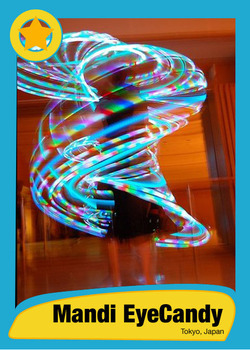 Trade online - use them a profile photos - print them out - add stats on the back as you like. There's a group at Flickr to share them, too. 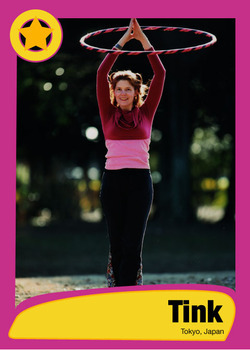 These are the first four in the series - me and some of my hooping friends. 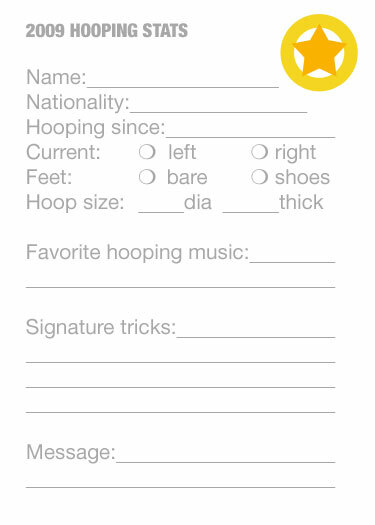 Let's make hooper trading cards for all our hooping buddies and superstars. Download this Photoshop CS3 template. Place your photo, type in your name and location, then adjust the visibility of the colored bits. Save as a jpg and Voila! Your own trading card. 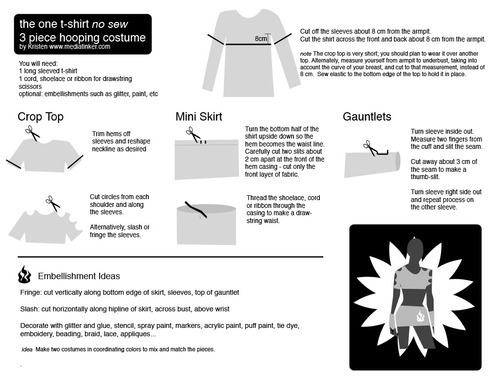 Use the template back to organise your hooping stats. Please note that card production may be delayed until the end of April. My friend Ellie carries her own chopsticks with her wherever she goes so that she doesn't have to use disposable chopsticks at restaurants. Each year, 25 billion pairs of disposable chopsticks (waribashi) are used in Japan. That's 200 pairs per person. There are a few recycling programs, but most used waribashi get thrown into the garbage. What a waste. 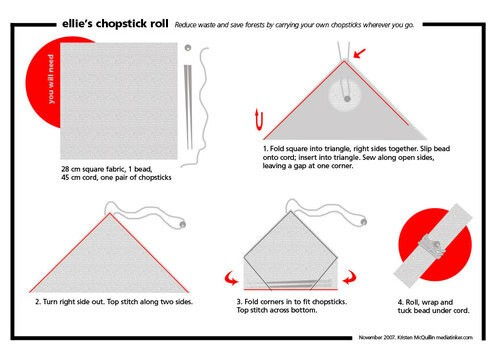 Ellie carries her "My Hashi " in her purse, protected in a roll of fabric. She'd like to make a few of these as gifts, but wasn't sure how to do it. So we sat down over a cocktail and I reverse-engineered the design. It's really simple and clever. 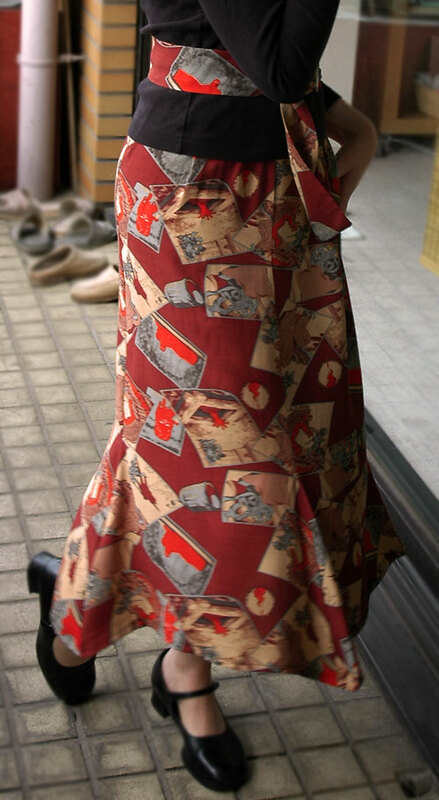 I bought some crazy kabuki ghost fabric a few weeks ago and it's been sitting around waiting for me to need a new skirt. Finally, I had a need for a nifty outfit, so I designed a flared skirt and whipped it up between breakfast and leaving the house. 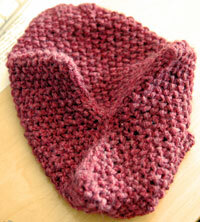 It's comfy stylish and easy to wear, so I wrote up the pattern in case you want to make one, too.